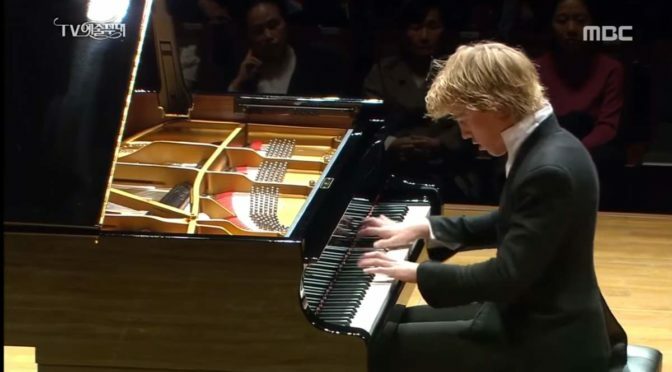 Lucas Jussen studied with Menahem Pressler in the US and Dmitri Bashkirov at the Escuela Superior de Música Reina Sofía in Madrid, where he was presented with the prize for “Best piano trio school year 2013/2014” by the Spanish queen Sofia. Allegro con brio The first movement is in sonata form: it has a repeated exposition with two subject groups, a development section, a recapitulation and a coda. It opens with repeated pianissimo chords in a straightforward but anxious rhythm, devoid of melody for two bars. It then swiftly ascends, followed by a three-note descent in the middle register and a four-note descent in the upper. This phrase is then repeated in B-flat major – a whole tone lower – a device Beethoven also used for the opening of the Sonata No. 16 in G Major (Op. 31 No. 1). After a half cadence to the dominant (G major), the opening phrase returns again, but this time in a tremolo variation. The second subject group, marked dolce, is a chordal theme in E major, the mediant key. Modulation to the mediant for the second subject area is another feature shared by this sonata and the Sonata No. 16. Later, Beethoven employed the same shift again (in the Hammerklavier Sonata, for example). For the recapitulation, Beethoven transposes the second subject into A major, quickly changing into A minor and then back to C major for the coda. Introduzione: Adagio molto (in F major) replaces the F major movement that Beethoven initially intended to use. Apparently, the composer renounced at this part since it was to lengthy. He did, however, published the movement separately, as the Andante Favori, WoO 57. The music gradually gets more agitated before calming down to segue into the last movement, the Rondo. Rondo. Allegretto moderato – Prestissimo The Rondo begins with a pianissimo melody played with crossed hands that soon returns fortissimo, over daringly fast scales in the left hand and a continuous trill on the dominant in the right, as described above. The second theme, a series of broken chords in triplets, is soon interrupted by a turbulent section in A minor that foreshadows the central episode. The music returns to C major, and the sweet theme is repeated, followed by a series of staccato octaves in C minor that mark the start of the central episode, one of the few cases where such a melodic change is seen, a tactic repeated in larger works like the Emperor Piano Concerto. Soon the octaves are accompanied by swirling triplets in the left and then the right hand. The music grows more tense and eventually reaches a cadence in C minor. The next section brings back the opening theme in chords and further develops it: it appears in A-flat major (bars 221 – 224), then F minor (bars 225 – 228) and then D-flat major (bars 229 – 232), when it is fragmented into shorter phrases (233 pickup – 238) and then transits into a quiet section with major 7th arpeggios, returning after much drama to the C major theme played fortissimo. The second theme reappears, followed by another characteristic long line of beautiful dance-like music. Another series of fortissimo chords announces a short, delicate pianissimo section: the movement seems to die away but then unexpectedly segues into a prestissimo coda that plays with the various themes of the movement, ending in a triumphant rush of grandeur.